Miniature squat neckless jar with collared rim and flat base: complete. 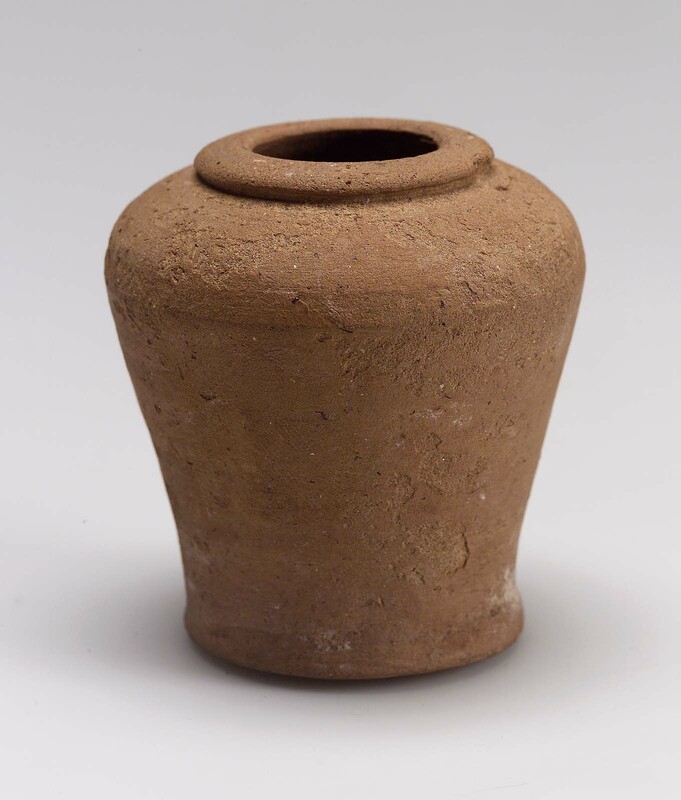 The entire vessel was manufactured using the wheel, as is common for this class of pottery. In addition, the bottom of the base was finished on the wheel. The jar is unslipped and has some white blotches on the exterior. HH 1016/4 written in black on the bottom of the jar. The form is very similar to other miniature neckless shouldered jars like 13-12-22c.1, but less restricted around base and generally shorter and better made. Also // 20.1902. From Giza, G 7000 X. Exp.Ph. B 8763 2/1 / BG. 451. 1934: excavated by the Harvard University-Museum of Fine Arts Expedition; assigned to the MFA in the division of finds by the government of Egypt.